Aluminum mailboxes are usually the preferred choice among customers who are looking for a high-quality residential mailbox. The greatest advantage of an aluminum mailbox is that the desired finished mailbox with the decorative details can be manufactured. These fine details can be as elaborate such as the Victorian minutiae. This also ensures that the specially designed die of the aluminum mailboxes can produce the same quality mailboxes. On the other hand, steel mailboxes with the intricate details are quite costly and difficult to manufacture. Another advantage of aluminum mailbox is that they are resistant to rust and therefore require little maintenance for a few years. This makes it an obvious choice for areas that have a moist environment. Steel and iron mailboxes need to be coated with a protective powder, before being installed in such environment. Moreover, the aluminum mailboxes do not tend to dry out or crack when they are exposed to sunlight for a prolonged period. It is due to this reason that the aluminum mailboxes are the ultimate choice for installing in all kinds of weather conditions. 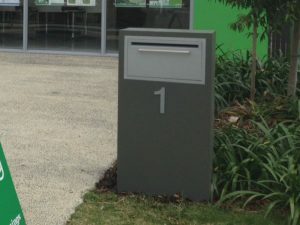 All the advantages of aluminum mailboxes must be considered when you are looking for a suitable material of a new mailbox that is to be installed. Article by MailboxResidential.com. Browse their incredible catalog and replace your ageing mailbox with something that is new, secure, and adds to the value of your home.